In true Anarch style, this card varies wildly between being nearly useless and absurdly strong, depending on the matchup and when it gets played. If you manage to drop it early against a horizontal build (Near-Earth Hub, Gagarin, Replicating Perfection) while they still have most of their assets unrezzed, you can seriously cramp their style. No corp is going to risk losing an agenda from HQ just so they can rez a Melange Mining Corp. or a Sundew. They might rez Caprice or Ash to save an agenda, but that is still a costly play. Even Jackson Howard doesn't help, because you have to rez him before you use him, which causes another card to get trashed. But, by not rezzing their economy assets, they will lose a huge amount of tempo, making it harder to score the agenda they need to break free from the current. But, this requires that they are playing economy assets, and that they have them installed and unrezzed. It's not enough that they just have unrezzed remotes: Personal Evolution doesn't intend to rez that Snare!, Psychic Field, or Ronin, so Hacktivist Meeting doesn't particularly bother them. 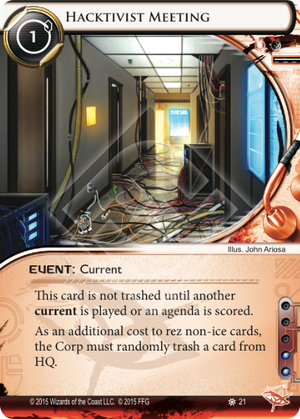 Weyland (especially core-set BABW) generally relies more on operational economy rather than assets, so they can still make money, rez ice, and score agendas, ending the Meeting before anything gets done. Even against a true horizontal deck like NEARPAD, there are still some issues. You have to be willing to check every unrezzed remote, because all it takes is one cold-installed Astro or Beale to turn off the Meeting when they triple-advance the following turn. Hackivist Meeting also doesn't stop the AstroTrain once it's started; you don't rez agendas, so they don't lose cards. And of course, if you don't manage to find your Meeting until after they've got their PAD Campaigns and Dedicated Response Teams rezzed, you aren't getting much benefit. Lastly, it is a current, which means that if the corp plays a current of their own (Lag Time, Paywall Implementation, Enhanced Login Protocol, Manhunt) you lose your Meeting. Not every deck is running currents right now, but enough of them are that this cannot be discounted as a possibility, and this number will only increase as more currents are released. But by the same token, as more corps play currents, the need to have a runner-side counter increases accordingly. Even if Hackivist Meeting won't force any trashes, it's still worth playing if you can deactivate the Enhanced Login Protocols from Replicating Perfection.